This dataset is of the depth in metres to the water table, which may also be referred to as ‘phreatic groundwater level’, the ‘rest water level’ or ‘static water level’. Strictly speaking the water table is a concept only applicable to unconfined aquifers; aquifers in which water is free to drain vertically from the ground surface to the aquifer. Confined aquifers occur when a layer of impermeable rock or soil overlies an aquifer that is fully saturated, allowing the water within the aquifer to be pressurised. The groundwater level in a confined aquifer is more properly described as a potentiometric surface, and represents the theoretical level to which water would rise if the confining layer were not present. This dataset does not model levels in confined aquifers. Perched water tables occur when there are lenses of impermeable material in a rock that is otherwise permeable. These allow small localised water tables to develop over the lenses, which can overlay a regional water table in the surrounding rock mass. This dataset does not model perched water tables. The depth to groundwater dataset is produced with a 50 metre pixel resolution; with supplementary data prepared for use at 1:50 000 scale. Depths of > 100 metres are rendered as 100 metres. The depth to groundwater dataset is based on a simple conceptual model of interaction between surface water bodies and groundwater. It assumes that groundwater and surface water are in hydraulic continuity, so that groundwater is unlikely ever to be below a surface interpolated between surface water bodies, ‘river base level’. In weakly permeable materials, where drainage is poor, surface water drainage networks are dense, and interpolation will tend to produce groundwater levels relatively close to the ground surface. In highly permeable material, sparse surface water drainage networks mean that groundwater may be at greater depth between surface water bodies. While this dataset does not use observations of groundwater level directly, it has been shown to compare well with groundwater levels interpolated from measurements on boreholes in areas where sufficient data are available. Identification of areas where special care is required in the interpretation of results. The surface water bodies used have been derived from the OS Vectormap District dataset, which is a detailed vector dataset of topographical features with a nominal scale of 1:25,000. Surface water body lines in the dataset represent not only the centreline or banks of rivers, but may also outline ponds and other small water bodies, frequently artificial. Rivers within the dataset are also broken into segments by bridges and other infrastructure. To prepare a dataset that contains only rivers and major water bodies that are likely to be in contact with groundwater, an iterative process was used; gaps and breaks in the surface water lines dataset of less than 50 metres were closed by creating buffered polygons around each line segment, and aggregating overlapping polygons. Major rivers were extracted from a 1:50 000 scale vector map of rivers, and this was supplemented by the OS Vectormap District coastline. A buffer was applied, and all the aggregated polygons enclosing surface water bodies that intersected this buffer were selected. This process effectively identifies major rivers and their tributaries, while ignoring line work that represents isolated ponds and minor watercourses away from river systems. The smoothed surface between the surface water bodies selected was constructed by assigning an elevation to the surface water bodies and the coastline using data from the OSTerrain50 DTM, which is a digital terrain model on a 50 metre grid. A surface was fitted using the ArcGIS Topo to Raster tool, which implements a discretized thin plate spline technique, a surface generation methodology optimised for topographic surfaces based on the ANUDEM algorithm. Once a surface has been constructed this is converted from an absolute depth in metres relative to Ordnance Datum, to a depth below ground level. In this step a number of corrections are applied. Firstly, the water table is lowered by 1 metre to correct for incision of rivers; this also corrects for the fact that the coastline used in the interpolation represents a mean high sea level, whereas groundwater near the coast is expected to be closer to mean sea level. The data are then subtracted from the OSTerrain50 DTM. In the resulting raster dataset a proportion of levels were found to be above ground level, especially at the base of steep scarp slopes; these are corrected to ground level. In areas of high terrain relief, groundwater levels may be interpolated at unreasonable depths, if the river network is sparse. Observational data suggests that water tables in the UK are almost always above 100 metres below ground level. In areas where water is very shallow presenting the raw data might imply a greater than warranted accuracy. The data are therefore censored to set any levels of >100 metres to 100 metres, and any of < 2 metres to 2 metres. The final stage of processing involves the identification of areas where particular care is need in interpretation of the data. In this version of the dataset these are primarily areas where low permeability materials have been mapped in the subsurface, derived from the BGS Permeability Index dataset. Further areas where special care is needed in interpretation will be added in subsequent releases (e.g. areas under open water and areas of known artesian groundwater). These have been compiled into a vector dataset that provides guidance on the interpretation of the data (Table 3). 1 Low permeability superficial material present - soils may be saturated. 2 Low permeability bedrock present - soil or superficial material may be saturated, bedrock may be effectively dry. 3 Low permeability superficial material and bedrock - soil may be saturated, bedrock may be effectively dry. Users requiring groundwater level surfaces can use the OS terrain50 DTM to convert data to metres above ordnance datum. BGS is continually surveying and resurveying areas of Britain, improving and updating the geological maps and collecting hydrogeological information. As new data is collected, and conceptual models of groundwater occurrence and flow are improved, so updates are made to hydrogeological products. BGS is committed to improving datasets as more information becomes available. The depth to groundwater dataset discussed in this report, while the first to be formally released as a digital data product, is the third version produced by BGS. Version 1 (released 2004): Depth to groundwater dataset using OS Panorama DTM and surface water bodies derived from OS 1:50 000 mapping. Not released to external users or incorporated into digital data products. Version 2 (released 2007, updated 2010): River base level data derived from NextMap DTM, using a set of surface water bodies also derived from the NextMap DTM. The surface water bodies were subsequently refined by incorporating data on superficial and bedrock permeability. Not released to external users but was incorporated into other BGS digital data products. Version 3 (released 2015): Depth to groundwater dataset completely remodelled, using the OS Opendata OS Terrain50 DTM and surface water bodies from the OS Vectormap District dataset. Supplementary dataset prepared using BGS Superficial and Bedrock Permeability Version 6. Data is provided across Great Britain. 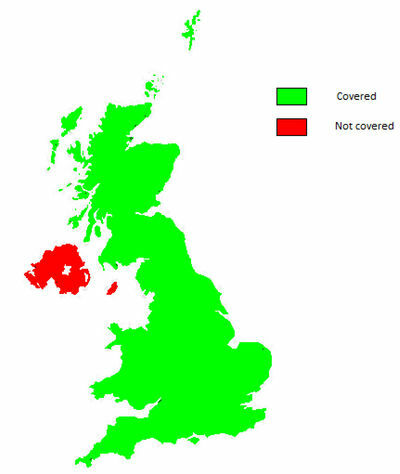 Northern Ireland and the Isle of Man are not included. Figure 2 The coverage of the BGS national groundwater level dataset. The groundwater level dataset has been created as a raster dataset in ESRI Grid format. Supplementary data is available as vector polygons. Both datasets are available in a range of alternative GIS formats, including ArcGIS (.shp), ArcInfo Coverages and MapInfo (.tab). More specialised formats may be available but may incur additional processing costs. Users of the depth to groundwater dataset should understand that it represents a model of how groundwater is expected to behave in the natural environment, and its primary use is in identifying groundwater levels in areas where direct observations are not available, or where having a spatially consistent dataset over large areas is advantageous. The groundwater level dataset has been developed at using a 50 metre resolution DTM, broadly equivalent to 1:50 000 scale, and it should not be used at larger scales. Depth to groundwater can vary significantly within 50 metres, especially in areas with steep relief. The depth to groundwater dataset is based on, and limited to, an interpretation of the records in the possession of the British Geological Survey at the time the dataset was created. Depths to groundwater presented in the dataset may vary significantly from those encountered in the field where a borehole is to be drilled or an excavation made. The depths represent the depth to phreatic groundwater in an unconfined aquifer. They take no account of seasonal fluctuations, and will generally represent seasonally low water levels. Sewers, land drainage and artificial waterways may lower or otherwise modify groundwater level locally. Pumped abstraction for water supply or other purposes (e.g. mine drainage) may lower levels, or artificial discharges may raise levels, both at a regional and a local scale, and over long time periods. The permeability index data used to identify areas where particular care is need in interpretation of the data, only identifies the permeability of the uppermost geological strata. In particular fluvioglacial and alluvial sediments may present complex layering of permeable and impermeable materials, leading to the development of locally perched water tables. These data are unlikely to be suitable for site specific assessments. If they are to be used for detailed advice to specific sectors of end users, e.g. home-buying, property insurance, site development and construction, then the BGS can provide additional end user guides and additional attribution details for the data. To find more about this, please contact our Business Solutions department through the Central Enquiries Desk using the contact details at the start of this document. This page was last modified on 23 July 2015, at 16:29.